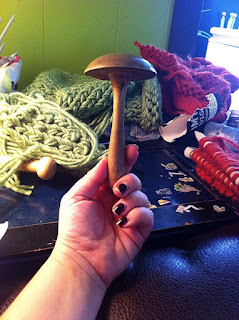 In the spirit of darning, here are two darning tools sent to us from Karlie King and Eileen Murphy! Eileen writes, "This was passed on to me from my mother' s cousin. Many feet continued to be warm and snug because this was used to mend the wear and tear." Thank you Karlie and Eileen for these great photos! By the way, did I mention the traditional darning workshop is tonight? You still have time to register! Join instructor Christine LeGrow tonight, Tuesday, February 16 between 6:15 pm-8:15 pm, at the A.C. Hunter Children's Library at the Arts & Culture Centre, 125 Allandale Road to learn traditional darning techniques.